Computer keyboard fixes: Slate readers offer their suggestions. 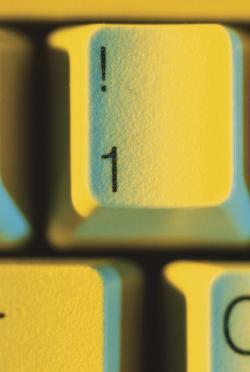 Is the exclamation point really in the right place on the keyboard? In an essay last week for Slate, I asserted that everybody hates something about their computer keyboard. After suggesting five small-scale adjustments—getting rid of the caps lock and insert keys, creating a dedicated em-dash key—I asked readers to provide their own desired keyboard fixes. Hundreds did so. Many advocated for smart tweaks I’d never considered. Other commenters worked together to come up with solutions to common keyboard-related complaints raised by their fellow readers. Overall, the comments seem to support my contention that nearly everyone struggles with some element of the contemporary keyboard. Commenter Gizdal, for instance, noted that control-alt-delete can be a bear to type and suggested a single dedicated key that would produce the same result. Meanwhile, Nick Lee noted his annoyance that the enter key resides so close to the shift key. “I can’t tell you how many times my little pinky has confused the two,” he wrote. While caps-lock-loving commenters referred to me as everything from “snooty” to “nontechnical” to “a Mac user” for wanting to do away with that key for good, other readers focused on the exclamation point and questioned the desirability of any tweak that would make that mark easier to type. And, you know what, those people are right. I agree with the gist of their argument wholeheartedly: Exclamation-point overuse is just as bad as caps-lock overuse. I don’t like that the exclamation point is located so far away from the period and question mark, and I still think it should be moved down to the bottom right of the keyboard. But making the exclamation point easier to type may not be the best idea. So if we’re moving it down there, let’s make it the shift option for the question mark instead of vice versa, as several commenters suggested. Commenter D-volt may have an even better idea for the exclamation point, which he or she referred to as “the most overused punctuation of all time.” D-volt would like to make it nearly impossible to type and suggested relegating the exclamation point to an obscure control-option-shift combo “or something equally cumbersome.” Jebbiii takes that sentiment one step further: “[M]aybe make someone wait 10 seconds between each click,” in order to preclude typists from using multiple exclamation points in a row.